Battery 3/Tonie was one of ten fixed batteries constructed in the IV and V defense areas as long-range batteries with infantry annexes on both flanks. It is located near the main fort „Tonie”, on the edge of the Sudoł creek escarpment and next to today’s Łokietka street – on the very border of the city of Cracow. 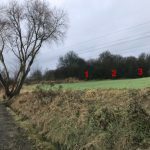 In this location, first in 1897, it was planned to build a supplementary fort, which “developed” in the planning campaign 1898/99 to the notation as Infanteriewerk 44 b. In February 1902, the Geniedirektion in Cracow started design works on the Sicherheitsarmierung (i.e. on alarm duty) batteries, located between the forts. Interestingly, the belts of camouflaging acacia and spruce trees were planted earlier than the objects were built – starting already in 1900. 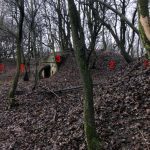 The batteries consisted of six open gun emplacements, separated by hollow traverses and contained permanent shelters for artillerymen and handheld ammunition stores. The buildings were resistant to medium caliber shellings (up to 15 cm) and made of bricks and stones, with flat concrete roofs. Entrances were protected by so-called mantels – characteristic, arched tunnels made of concrete – on a corrugated formwork. In addition, the battery contained an observation post under a cast-iron cupola (model 1887). Some of the batteries were preceded by a moat with wire obstacles, some were additionally equipped with infantry positions (so-called Annexes) used for self-defense. Captain Carl Hochleitner was in charge for the coordination of the construction of all batteries, while officers of Lieutenant rank were responsible to the individual pair of objects. The construction of the battery in the vicinity of the main fort „Tonie“ (the naming of the battery was subject to several changes, in 1914 finally marked B. 3/Pękowice and B. 3/Tonie) was supervised by Lieutenant Walther Eger. Construction began in July 1902 with the acquisition of land, after which earthwork and brickwork were carried out. In October 1902, the concrete ceilings of the shelters were casted. In December of the same year, the battery 3/Tonie was finished. The General Inspector of Engineering remarked during an inspection the Krakow batteries as properly and reliably made. Due to the location on the hill slope, the lowest infantry trenches were to fire along the nearby road. Individual cannon positions were placed in step by step terraces, so the level difference between the extreme positions is almost 4 meters. At the highest point on the right wing of the battery, an observation post was placed. 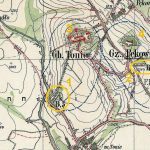 The area from the battery towards fort „Tonie“ was protected by an infantry position, placed several dozens of meters north of the battery. 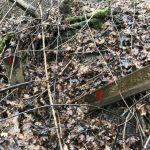 It was an oval earthwork built in 1905, with a place for a makeshift wooden shelter. Four old cannons, 15 cm M.61, were placed in the open gun emplacements. A three-day supply of ammunition stored in the shelters was supposed to amount to 720 pieces. During the mobilization works in 1914, the open emplacements were protected with wooden canopies. The entire group was extended with field fortifications – additional batteries and infantry positions. Briefly after the war, these batteries were leveled under cultivated fields, but not within the area of battery 3/Tonie. 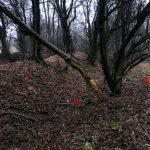 Till today the zigzag running trenches have survived, and a trench on the edge of the slope above the creek. Also the moat and trench profiles within the infantry position are clearly and legibly visible. Since the 1970s, the route of the northern Cracow by-pass has been planned in this area. 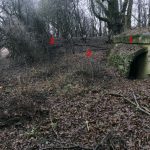 Back in 2010, the entire area surrounding Werk „Tonie” (GHW 44) was entered into the register of monuments protected by law – under the name „cultural landscape“: a collision-free intersection of fortress roads with the so-called Red Bridge (brick viaduct), ammunition shelter G. M. M., battery 3/Tonie with infantry annex, and masking greenery (still readable compositions of tree stripes, arranged geometrically). This was favored by the then state of land development – in this very distant, northern periphery of Cracow, there was no spontaneous and chaotic development yet, the so-called urban sprawl. Judging the known plans of the prospective highway, the route will, however, affect the monuments. The main lane will cross the area of battery3. Perhaps the shelters themselves will not suffer, but the right shoulder of the battery, the system of trenches and the well-preserved infantry redoubt will be leveled. The new road embankment and pillars of the planned bridge will dominate the surroundings. The battery itself will be in the highway strip near the roadside, so access to it will be at least difficult. 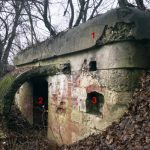 Batterie 3/ Tonie war eine von zehn Batterien, die in den Verteidigungsbezirken IV und V als Fernkampfbatterien mit Infanterie-Annexen an beiden Flanken ab 1902 konstruiert wurden. Sie befindet sich in der Nähe des Hauptwerkes „Tonie”. Die Batterien bestanden aus sechs offenen Geschützpositionen, für 4-15cm M61 Kanonen, die durch Hohltraversen getrennt waren, welche aus Ziegeln und Steinen mit flachen Betondächern hergestellt waren. Darüber hinaus enthielt die Batterie einen Beobachtungsposten mit einer Gusseisenkuppel (Modell 1887). 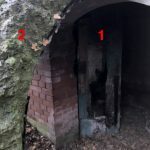 Das Gebiet von der Batterie zum Werk „Tonie“ wurde durch eine Infanteriestützpunkt gesichert, der sich einige hundert Meter nördlich der Batterie befand. Kurz nach dem Ersten Weltkrieg wurden diese Batterien eingeebnet, jedoch nicht die Batterie 3/ Tonie. 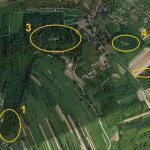 Bis heute sind die im Zickzack verlaufenden Gräben und ein Graben am Rand des Abhangs oberhalb des Baches erhalten geblieben. 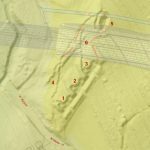 Auch die Graben- und Grabenprofile innerhalb der Infanteriestellung sind gut erkennbar. Seit den 70er Jahren ist in diesem Gebiet die Route der nördlichen Krakauer Umgehungsstraße geplant. 2010 wurde das gesamte Areal um das Werk „Tonie” (GHW 44) in das Verzeichnis der gesetzlich geschützten Denkmäler eingetragen – unter dem Namen „Kulturlandschaft“. Nach den bekannten Plänen der voraussichtlichen Autobahn wird die Route jedoch die Monumente beeinflussen. Die Hauptspur wird den Bereich der Batterie 3 durchschneiden. Vielleicht werden die Unterkünfte selbst nicht leiden, aber die rechte Schulter der Batterie, das System der Schützengräben und die gut erhaltene Infanteriestellung werden eingeebnet. Der neue Straßendamm und die Pfeiler der geplanten Brücke werden die Umgebung prägen. Die Batterie selbst befindet sich im Autobahnstreifen in der Nähe des Straßenrandes.